Google is slowly but surely bringing Material Design (an important element of Android 5.0 Lollipop) to all of its mobile apps, regardless of platform. The latest to get the Material Design treatment is the main Google app for iOS, which today received an update to version 5.0.0. Apart from having a different look, the enhanced Google app for iOS comes with new functionalities, including a new Google button that allows you to quickly start a search, and a new Recents button - which, just like on Android Lollipop, lets you find (and flip through) recently viewed pages. What’s more, Google Maps is now tightly integrated with the app, so you can easily search and find places, or explore maps - without leaving the app. The new Google app for iOS is obviously free, and it’s optimized in particular for the iPhone 6, iPhone 6 Plus, and iPhone 5 (though it’s compatible with any device running at least iOS 7.0). You can get it from the App Store at the source link below. 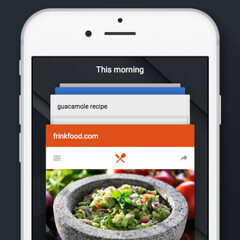 Are you using the Google app on iOS? If yes, let us know if you're liking the latest update! iOS shouldn't get that previlege. Of course they should. iOS has a lot of users. Of course they should. iOS brings in more revenue to Google coffers than Android. Is just business, you have to take care of the golden cow. They should try to use it before launching update. New UI of youtube is waste of space and hard to use. Guys need sugesstion !! Which phone to buy?? Iphone6 or 6'plus ?? 6+, better battery, better screen, OIS, better in every way. Unfortunately the 6+ is $100 more than the 6, just in case you didn't know. The 6+ is better in every ways: better screen, camera, battery life. The real problem is that it is really huge and made entirely from aluminum so very slippery in hand. If you are comfortable with that then 6+ definitely the way to go here. I got the 6 on the release date...I recently traded it for a 6 plus and glad I did. I find that the UI conventions Google was using on their iOS apps causes some confusion. The reason is that many of the conventions are just different from other iOS apps. It makes using iOS devices confusing when you use a mix of Google apps and non-Google apps.